Do I Need To Stake The New Growths Like They Were When I First Bought The Plant? 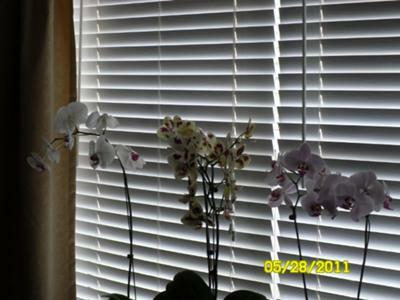 I purchased three orchids from Lowe's. They were in bloom and the stems were supported by plastic stakes that were attached to the stems by little clamps. I have pruned them, and am now seeing new sprouts coming out of the base of one of the plants. Question: Must I use the stem supports again, or will the plants grow toward the ceiling on their own?